Today I’d like to get down to table level and have a good look at the amount of crumbs left behind after meals! Yes it’s unavoidable… and if you have children the amount of crumbs left behind can be quite incredible! It looks horrible and you get crumbs on the bottom of everything you put down. You can of course get a wet cloth and wipe it clean each time, but that then means a wet surface, which has to dry, far more effective is to use a table crumb brush such as with a Mini Sweep Crumb Brush which is both easy and quick. In fact you may have already seen one of these clever little table brushes when out at a restaurant because it is often used in restaurants to quickly clean up the table debris after each customer. 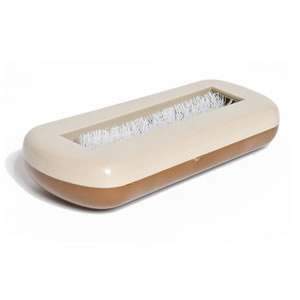 However there are many other uses for this crumb brush including cleaning the snow off your shoes and floors, cleaning dirt particles from hard to reach areas of your car and caravan (ideal for travel being so small too), cleaning areas of your carpets and rugs and it is even used to remove loose crumbs when you want a professional finish when icing a cake. As you can see in the video and picture the mini sweeper comes in two halves; it has no plugs, no leads, no batteries! So there’s even no need for charging. The Whizzkleen Mini Crumb Sweeper Brush really isn’t fussy! – it can pick up virtually anything… Whizzkleen picks up rice, crumbs, pins, nuts, bolts, screws, coins, glass and bulbs that are broken, pine needles, and it works brilliantly on stairs! It is the best mini sweeper to use. Get your hands on one at Caraselle Direct today with a full money-back guarantee! Next time I want to talk you through how to fit your Ironing Board Cover to get the perfect finish!